Since their first paper routes as children, John and Robert Flood have been successful business partners. Their entrepreneurial spirit and strong work ethic drove them into successful, but separate careers. John led his company to become Atlanta’s largest independent contractor for systems furniture installation. While Robert’s commercial construction company was thriving in the early 1990s building boom. This was the groundwork for coming together as a commercial relocation company. Today, Flood Brothers is still a privately owned company. 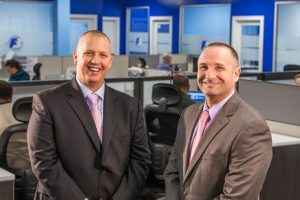 John and Robert’s dedication to supporting their clients, their employees, and the community have been the biggest contributors in making Flood Brothers one of the nation’s leading commercial relocation, furniture installation and warehousing companies. Partner with us and experience the Flood Brothers difference from other commercial relocation companies nationwide.